There was a time when Taft High was one of the worst schools in Ohio. Now students have their own laptops, tutors from Cincinnati Bell roam the halls, the newly built campus has gone high tech, and 95 percent of seniors graduate. The new, $19 million Taft Information Technology High School on Ezzard Charles Drive is a tech geek’s paradise, with nine computer labs—some dedicated to Macs, some to PCs—scattered across three light-filled floors, and wireless access and laptop plug-ins all over the place. There’s an interactive media lab where students create websites and storyboards and flex their graphic muscles, and a classroom fitted out for students to tear down, build, and repair computers. Students can even incorporate the building into their studies, by monitoring and analyzing the stormwater diverted by the school’s plant-covered, energy-efficient green roof. The new Taft High stands in stark contrast to the old one it replaced this spring: a low-slung Eisenhower-era structure where the clocks told the wrong time and the paint was perpetually peeling. But the changes represented by the new building are dwarfed by the changes of the past 10 years. A decade ago Taft was one of the worst schools in the state, where half the students flunked their freshman year and under 25 percent graduated; today the school graduates 95 percent of its seniors and two-thirds of them go on to college. Last fall, Taft, once a candidate for permanent closure, earned the state’s “Excellent” rating as well as the prestigious Blue Ribbon School designation from the U.S. Department of Education. In just 10 years Taft has managed perhaps the most difficult feat in American education: transforming a dead-end inner-city high school into a model of academic achievement. The effort has depended on hard work and good fortune, discipline and data-driven analysis. It has required a faculty willing to spend lunch and after-school hours creating a culture of achievement; a corporate partner in Cincinnati Bell to provide services beyond what the school district can; an academic focus to show kids a clear path to future jobs; a small platoon of tutor-mentors to guide students along that path; and a community that had a say in what the school should be. But Taft’s transformation has been built on more than systems and goodwill. It has also required the visions of two very different people—school principal Anthony Smith and Cincinnati Bell CEO Jack Cassidy—that have meshed to create something more than what either could have done alone. Smith, a quietly intense man with a missionary zeal about individual student performance, and Cassidy—blunt-spoken, business-driven, and extroverted—are an unlikely duo. Their partnership is so serendipitous and the resources poured into the school so extensive that it’s easy to question whether the success could possibly be repeated elsewhere. But whether the Taft High metamorphosis is a model for others or just a singular miracle is beside the point. If you’re looking for a city school transformed, it’s something to see. It’s a chilly Wednesday morning in the cafeteria of Taft’s temporary space in East Westwood, in a building they’ve occupied for nearly three years while their new building has been under construction. The school day has just started and pairs of people—one student and one adult tutor—sit at round tables poring over math and history books, prepping for the required Ohio Graduation Test. A chafing dish of breakfast burritos, baskets of muffins, and carafes of orange juice and coffee sit on a table in the front of the room. The quiet exchange of information is punctuated occasionally by the furious scribble of pencil on paper. The scene is extraordinary on several levels. The tutors are all Cincinnati Bell employees, here on company time and transported by a company shuttle. There are vice presidents and customer-support representatives, volunteers who are new this year and others in their seventh year, even a retiree who comes twice a week. The students in the room, meanwhile, are nearly all 10th-graders; the school’s seniors and most of the juniors have already passed the Ohio Graduation Test, and 10th grade is the earliest a student can take it. 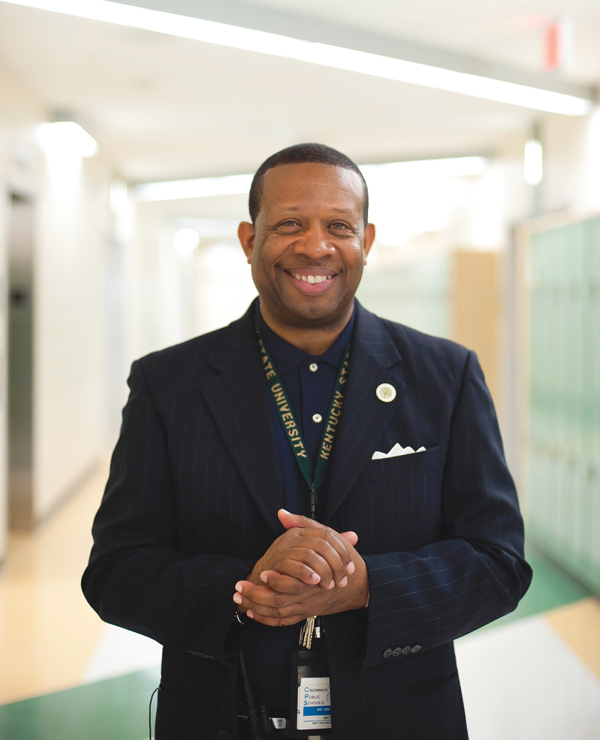 When the school year started, not all of the students here were convinced they needed the extra help, but principal Anthony Smith was. Smith strides into the room in a full-length wool overcoat with a plaid scarf tied around his neck. A soft-spoken man with a direct gaze, he’s scanning as always for potential problems: non-students on campus, students who aren’t where they’re supposed to be, arguments or loitering or any other distractions. All’s quiet for now, so Smith begins to break down how the school designed this tutoring program, which he considers the cornerstone of Taft’s turnaround. School officials insisted that the twice-weekly tutoring be held during morning school hours, instead of before or after school like many programs. “Some kids have jobs, some kids take care of other kids, some kids have kids, some have extracurricular activities,” says Smith. “Every time you tell kids something is important and you add it onto the end of the day, that tells them it’s not really important.” The time also works better for tutors than afternoons, when the day’s work and meetings tend to pile up. The hot breakfast, provided by Cincinnati Bell, helps lure reluctant students and nourish hungry ones, and food can help break the ice between tutors and students. Volunteers are carefully screened for what subjects they are comfortable with, because a tutor who doesn’t know what he’s talking about is beyond unhelpful. And there’s a string of back-up students identified in case a kid doesn’t show up, because nothing kills a tutor’s enthusiasm like wasting an hour alone in a high-school cafeteria. Even the round tables and booths in the room were chosen because they create a warmer atmosphere. Those one-piece seat-table things you see in other cafeterias? Everybody knows that’s prison furniture. This obsessive attention to detail and ability to anticipate obstacles are hallmarks of Smith’s tenure at Taft, and his success here has been all the more noteworthy because of this fact: He didn’t want the job in the first place. Ten years ago Smith was principal of the now-closed Bloom Middle School, the “back on track” school where students were sent after they had flunked at least one grade. He was making headway at Bloom and loved it; he jokes that he also enjoyed being taller than most of his students. The CPS superintendent at the time was Steve Adamowski, and Adamowski wanted the city’s high schools to focus on specific areas of study—like information technology or entrepreneurship—to guide students toward careers. Adamowski felt that Taft, with its woeful track record and beat-up building, was the place to start. In the summer of 2001, Adamowski asked Smith if he would take over at Taft. Smith had grown up in the West End and graduated from the school in 1973, and he agonized about whether to take the job. It chagrined him to see what his alma mater had become—a place where students were as likely to become parents or earn a rap sheet as they were to collect a diploma. He had some ideas about how to right it, but he felt like he was really accomplishing something at Bloom. He went to a district meeting intending to talk to Adamowski privately, to turn down the offer. But when he walked in the room, Adamowski introduced him as the new Taft principal. And there was no turning back at that point. Despite Smith’s initial misgivings, the challenge of Taft appealed to him. Founded in 1955, the school lacked the history, legacy, and alumni power of other high schools in the Cincinnati Public Schools system. On top of that, it had deteriorated along with the surrounding community since the days Smith went there. In high school, Smith knew he was expected to go to college and succeed; he attended Kentucky State University in Frankfort, drawn by the opportunity to play percussion in their band, then did graduate work at both Xavier University and the University of Cincinnati. But when he arrived in the principal’s office in 2001, he wasn’t sure what the community expected of Taft and its graduates. Under the school redesign plan, Smith also had the chance to bring in a new staff, and in his first few days he called the entire faculty to a meeting. He asked them why they thought the school was performing so badly, and outlined what he thought it would take to turn it around. Then, just as the first half of the meeting was ending, Smith made them an offer. “If you don’t want this school to get better,” he said as the teachers rose to take a break, “just don’t come back.” After the break every staff member was back in the room. In the weeks that followed, Smith met with each teacher individually to hear what needed to be done. English teacher Kelly Rozelle remembers the intensity of those days. At some point in those amped-up early days when Smith first took the principal’s job at Taft, there was a meeting at CPS headquarters between district officials and representatives from the Cincinnati Business Committee. Smith had been invited but by the time he arrived there was only one seat left in the room, next to Cincinnati Bell CEO Jack Cassidy. Cassidy is not what you expect in a corporate leader: A college drop-out, he remains at heart a salesman who, in his words, can charm the birds out of the trees. Part of that charm is a brand of candor not often found in executives, a trait that Smith has come to appreciate. Taken aback, Smith explained that it was his first week. “He said, ‘You’re in this nice suit and you run this slum of a school. What the hell is your problem?’” Smith says. “I was offended.” But they kept talking, and soon Cassidy made plans to visit the school. Cassidy sized Smith up and saw he was serious about turning the school around. Plus, the plan—already in place—to turn Taft into a technology-focused school made an information-technology company the perfect partner. The two men continued talking about everything from school reform to incentives, and Cassidy even accompanied Smith on some of his community visits to talk to West Enders about the new partnership. On his first visit to Taft, Cassidy said the building reminded him of something in war-torn Beirut. He asked if he could send some Cincinnati Bell employees over to see what they could do to the place; a skeptical Smith agreed. In short order, 500 Bell employees and their families descended on the school with paint cans and scrub brushes. Smith sent a few hundred Taft students to help, and the school was clean for the start of the 2001–2002 school year. The makeover continued, albeit in a decidedly more high-tech way: plans for the partnership called for a 21st century infrastructure, so Cincinnati Bell brought in fiberoptics and hard-wired the building. When he started as principal, Smith had his own challenges just convincing Taft students to show up for class and care about their grades. Mike Turner, who worked with Smith at Bloom and now serves as his top lieutenant at Taft, remembers one shaken student telling him, “ ‘That man [Smith] went crazy. He went on a rampage. He was asking everybody what their GPA was and how many credits we had.’ ” There was one student, Turner recalls, who asked what a GPA was. The varsity football season, which in years past had sent several players to the NFL, was cancelled Smith’s first year because not enough students qualified academically to play; in fact, in a school of more than 700, only 35 kids had grades high enough to play sports. Smith knew it was going to be hard work remaking Taft, but that kind of statistic alone was demoralizing. From the initial spruce-up and wiring, Cincinnati Bell’s involvement grew. The company began hiring students for internships and giving college scholarships to Taft grads. They offered incentives, such as a raffle for a television to boost attendance at traditionally empty parent meetings. And Cassidy was the one to suggest laptops for kids with good grades. Like any initiative, there were unforeseen consequences, and Cassidy managed them like he would at work. At the time the program began, modems were generally dial-up, and when the kids were using their laptops their parents couldn’t use the phone. The students told the CEO about the problem at a meeting. “Jack said, ‘At my company when somebody has a problem they try to come up with a solution,’” Turner remembers. “A girl stood up and said, ‘I have a solution. Give us cell phones so when I’m on the computer my mom can still use the phone.’ Jack said, ‘OK, cell phones!’” Now every junior and senior with a GPA above 3.3 gets a refurbished laptop and cell phone, and Cincinnati Bell comes to their houses to wire them for broadband. While it is Smith’s vision that is carried out on school grounds, Cassidy is also central to what has happened at Taft, says Adamowski, who has studied school transformations across the country. “In most cases the school district isn’t capable of doing this themselves; it requires a partner,” he says. “I’m absolutely sure this couldn’t have been done without the participation of Cincinnati Bell.” And when the CEO is going to football games and attending graduation ceremonies—and, in Cassidy’s case, giving out his personal cell phone number to every kid—it signals to the rest of the company that the partnership is a top priority. Smith laughs as he recalls the first awards ceremony—the one where students got their laptops and cell phones. Not one male student qualified for a laptop. “Here comes Tamika, here comes Ashley, here comes LaShonda,” Smith recalls. “Jack grabs the microphone and says: ‘Where the hell are all the brothers?’” Apparently the public challenge worked: From that day on, Smith says, the percentage of boys who earned the electronic rewards climbed steadily. Now the boys on stage often outnumber the girls. Still, while the electronics and Cassidy’s presence draw much attention, it is the twice-weekly tutoring sessions in the Taft cafeteria that Smith and Cassidy both believe are at the heart of the school’s transformation. Tutors prep students in math, science, writing, reading, and social studies—the five subjects of the Ohio Graduation Test; they attend graduation and awards ceremonies, band recitals and basketball games. They bond with the kids over academic success and bond with each other on the bus rides to Taft, and Smith says discipline problems school-wide are lower on days when tutors are around. If pressed, he’d give up the laptops, cell phones, and ceremonies before he’d give up the tutoring. Adamowski notes research that says turning a school around requires three things: rigor—the same high-quality program for every student; relevance—programs that allow students to see a future for themselves; and relationships—a school that is small enough and organized so that each student has at least one significant adult to turn to for help. At least one of those three principles has infused every change at Taft, and plans going forward use them as touchstones. That’s not to say all is perfect at the school. Some kids still stumble on basic math problems, and tutors say there are gaps in the information the students should have learned early on in school. Other students—freshmen and sophomores especially—tend to slump at their desks in class or ignore a teacher’s commands to get to work. At lunchtime, Smith will sit in with a group of five teachers who share the same 150 or so kids all day. They meet regularly to trade information on their charges, on the assumption that they teach better in cooperation than isolation. On this particular Wednesday, several are worried about a student who’s skipping morning classes regularly. They plan to write a letter to the parents of another problem student and invite yet another student to a lunchtime meeting of the teaching team so they can outline their concerns. There is also the certainty that one day Smith and Cassidy will retire or leave for other jobs, which could make the future of the partnership uncertain. That both have managed to stay in their positions for a decade is remarkable and contributes to the sustainability of the changes; in particular, principals who post gains tend to leave after three or four years—lured away by other schools hoping for the same kind of turnaround. For now, Smith is making plans for next year, the first full year in the new building. Because the influence of the tutors has been so profound, the school is assigning Taft employees—security guards and cafeteria workers as well as teachers—to each student as advisers, so they all have another adult in their corner, rooting for them and pestering them about their GPA. This year, Taft students began tutoring students at Frederick Douglass Elementary in Walnut Hills, and there are plans for a peer-tutoring program at Taft. The tutoring and academic preparation will continue, as will the Bell internships and scholarships, all of it adding up to a culture where achievement is expected. This summer another group of Taft students will report for work at Cincinnati Bell’s headquarters downtown. Like Sabrina Fowler, a graduating senior who worked in the company’s human resources office last summer, they will probably be excited and nervous, and over 10 weeks they’ll learn skills that will last them a lifetime. Fowler and her fellow seniors will graduate this month after spending less than two months in the new building. Fowler will head to Clark Atlanta University, where she’s planning on majoring in chemistry to pursue a career in pharmacy. She and her classmates will have gotten just a taste of the new building’s perks: the Senior Institute, which reserves the top floor for seniors only; the central courtyard and glass-walled atrium; the college-resource center, where students can get help applying for admission; the views of Music Hall, downtown, and the Cincinnati Museum Center. The incoming freshmen will spend four full years here, and the seniors admit to a bit of envy. But it’s tempered by gratitude for the education they’ve received. Originally published in the May 2011 issue.